Digital Surface Roughness Tester is compatible with four standards of ISO, DIN, ANSI and JIS and is widely used in production site to measure surface roughness of various machinery-processed parts, calculate corresponding parameters according to selected measuring conditions and clearly display all measurement parameters. We are providing a wide range of Digital Surface Roughness Tester which is the latest addition to our growing line of precision surface roughness testers and profilometers. This surface roughness tester is "state of the art" with a full slate of advanced features along with precision and accuracy that you demand. 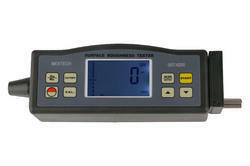 Extremely sensitive and highly accurate readings from roughness tester are offered via 15 popular surface roughness scales including Ra, Rq(Rms), Rt, Rz and Rmax. It is quantified by the deviations in the direction of the normal vector of a real surface from its ideal form. If these deviations are large, the surface is rough; if they are small, the surface is smooth. Roughness is typically considered to be the high-frequency, short-wavelength component of a measured surface.